The world of multi-effects pedals is a deep one for guitarists, and going through this ourselves with friends, family and fellow musicians has us all-too familiar with the process of finding the “best” out there. We actually think if we said you should “buy this one” would be offensive — there are way too many gems out there to keep in mind, and in the end we recommend buying many of these to build up your effects arsenal. Many guitarists have told us that there’s no such thing as “too many pedals”, but how much you’d like to ultimately collect will be up to you. Today however we wanted to recommend 10 of our favorite picks as the best multi-effects pedals for guitarists, so here’s what we came up with. The guitarists most prized (and perhaps most messy) part of their setup is their pedalboard(s), or merely their collection of guitar pedals. A multi-effects pedal attempts to organize and consolidate all of your guitar pedals into one (we say attempt, because why not just add a multi-effects pedal to your existing pedals at the same time?). Adding a multi-effects pedal to your repertoire will do nothing but elevate your versatility and freedom in the effects world — you essentially have multiple guitar pedals (hence the name, although quite obvious) into one single unit you can bring with you to shows, band rehearsals or keep at home to practice or record with in your studio. As stated previously, we know many who merely stick a multi-effects pedal into their already-existing pedalboard. Others prefer just one as the ultimate and only pedal for them to use, regardless of where. 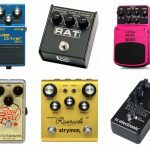 Beginner guitar players however may especially be attracted to a multi-effects pedal, especially if you don’t have a pedal yet — it can be a great way to introduce yourself to the world of guitar pedals and then venture out from there. 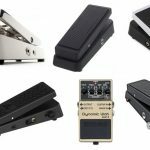 This way you can learn what all of these effects are, which suit your style and taste, and perhaps begin a collection once you get more of a hang of shredding. What effects do you want? This will be the most important part of shopping for the best multi-effects pedal since unfortunately there isn’t a pedal that literally has every single effect out there. Some come pretty close to an abundance of effects jam-packed into one pedal, but others will come with a specialty bundle. We’ll list the effects for each pick (keep in mind some have multiple variations of the effect as well) so you can decide for yourself. Most will of course come with the essentials, such as pedals with reverb, chorus pedals, delay effects, distortion, and more, while others get extremely advanced and have some rare FX not many may have even heard of before. Any other capabilities needed? 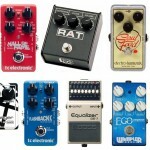 Many top-rated multi-effects effects pedals out there don’t just offer “multiple effects”. For those in need of more to their rig, a few of our recommendations are monsters, coming with preamps, recording interfaces, MIDI in and out, multiple expression pedals, numerous footswitches, inputs for microphones, special technology for processing your guitar tones, LCD screens for navigation, loopers, preset switching, already-made presets and chains, and more. While these features may stand out for some and be necessary, some just want a simple pedal with a few extra effects. We found both types to give you some options. What ins and outs do you need? Some of the best guitar multi-FX pedals come with our necessary simple power in, 1/4″ in and out, while others come with nearly 20+ different types of connections, such as MIDI, XLR, numerous USB for hooking up other gear, and more — these types usually act as the ‘hub’ of your rig. What stands out to you? How much cash do you have? 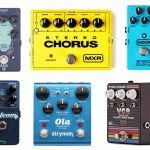 Many of these multi-FX pedals aren’t cheap, with some (especially those with recording interfaces and preamps built-in) going near the thousand dollar mark. Others with more simpler and efficient features will definitely be more affordable; however, what you’re able to buy will depend on how much cash you’re able to drop. Here’s our number one pick as the best multi-effects pedal, and this particular model is extremely popular among many guitarists in the world today. This is a floorboard pedal that you can add to your existing rig, have it merely act as a controller or keep it in the studio for a recording interface. This thing is jam-packed with features — amplifier modeling, an expression pedal, 12 footswitches, a simple interface for editing, both analog and digital is and outs, and of course, USB recording out on top of it all. It’s a bit on the expensive side here so your budget may dictate your pursuance of the Helix, but if you have the cash this is a beastly pedal (almost wouldn’t just call it a pedal). Line 6’s ‘dual DSP HX modeling engine‘ is also a standout and brings in high-definition amplification of your guitar with great compression and processing. It would be hard to just simply list every effect in here considering we have over 200 amp, cabs, mic, and effects inside of it — there’s even an XLR input for a microphone if you need (10 other ins and 12 outs, along with an 8-in/8-out audio interface via USB), as well as a nifty 6.2″ LCD screen for easy navigation. 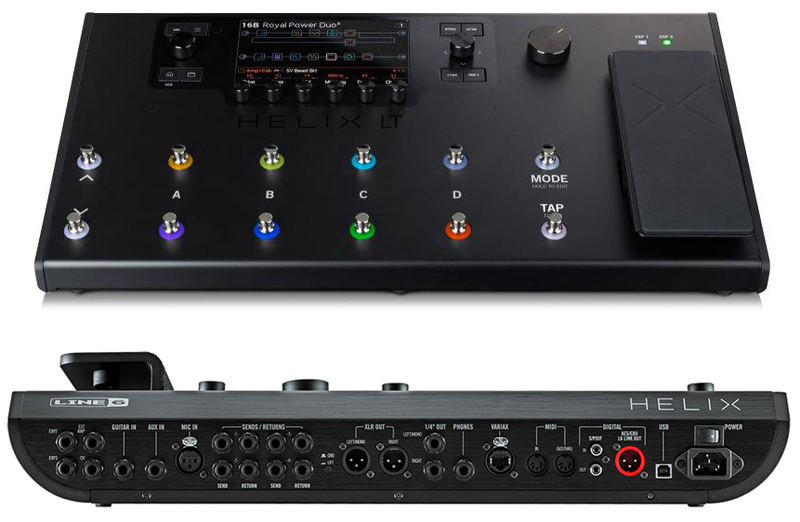 The Line 6 Helix is by far the best multi-effects pedal for guitarists in the market if you wanted more than just a pedal — you’re getting essentially an entire recording interface and preamp here as well. Up next, we have another famous pick to be the best multi-effects guitar pedal, and Boss’ GT-1000 still keeps us in the high-end category for now. It is however slightly cheaper than the previous Helix, so if you still wanted a top-notch pedal but needed to save a few bucks, here’s one to keep in mind. 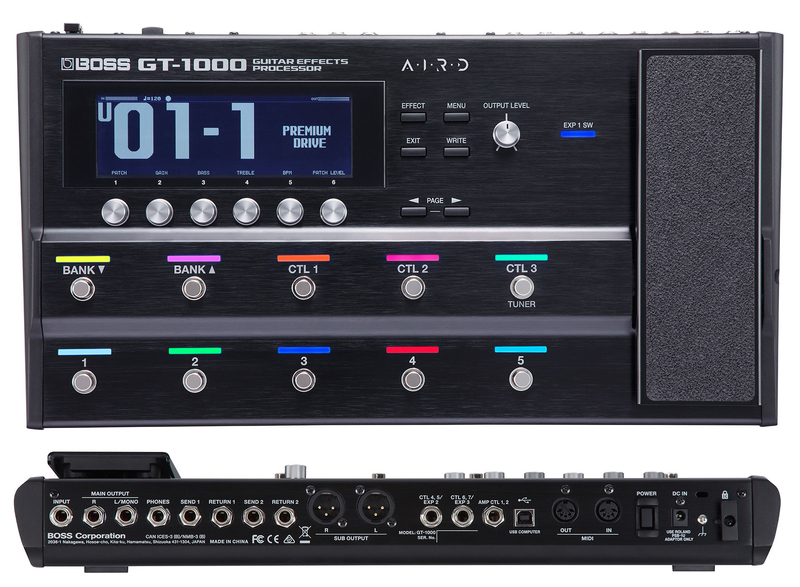 The GT-1000 packs a powerful punch as well — 32-bit AD/DA and 32-bit, 96 kHz sound processing, effects loops, MIDI, external control, USB connection, an expression pedal, both digital and analog ins and outs, as well as 10 footswitches. Boss has also incorporated extra technology for higher-end processing (digitally), including Tube Logic, ‘Augmented Impulse Response Dynamics’ (AIRD), and ‘Multi-Dimensional Processing‘ (MDP). These are all a bunch of fancy names we know, but ultimately they all combine to fine-tune how your guitar’s sound is both processed and amplified. A very clear, bright and natural sound with this. Another big standout and what may not a turn off for some (since it will definitely depend on not only your intended use but also how your rig is set up) is the computer-based friendly recording you’ll be getting here. Some just want a standard multi-effects pedal with a few effects here and there without a bunch of ins and outs as well as extra technology, while others will be blown away by it. For example, some don’t even need USB connectivity or the MIDI, while others only will. 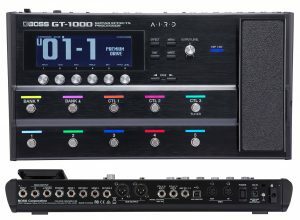 We’ll leave that up to you, but ultimately the Boss GT-1000 is a beast and by far another one of the best multi-effects pedals in the world. 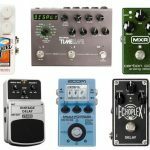 Let’s move down slightly in regards to price-point and be met with a guitar multi-effects pedal within the middle-range of this list. 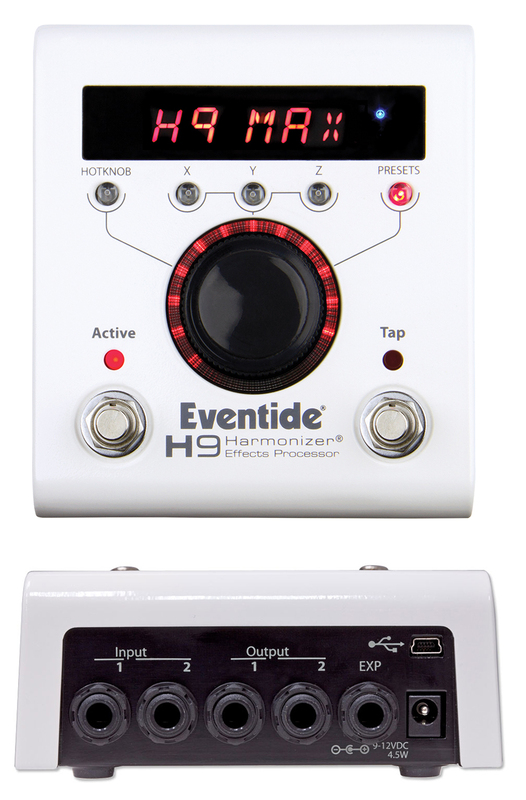 The H9 Max (also available in H9 or H9 Core versions — less expensive, but fewer features and capabilities) is very popular among guitarists due to the easy one-knob on-board programming and numerous effects and algorithms you’ll be getting at your fingertips. Not a whopping amount of ins and outs here but this will be a standout for some — many don’t need a bunch of expression pedals or XLR inputs. A big standout will be the technological advances and incorporation of digital-based algorithms. There is indeed a Mac/PC/iOS App if you’re interested (H9 Control App), and you can download the available algorithms but you’ll have to use a tablet or computer to work them. It comes in the box with 99 factory presets however you can download about 500 more with their. 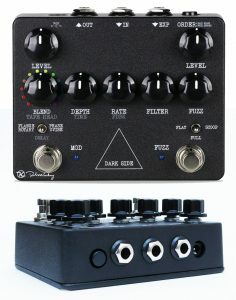 Ultimately you can employ all of the brand’s stompbox effects into this one unit, and they have some fancy effects not many others compete with (as you can see in the list). Lastly, there is a built-in tuner which is never a bad thing, and something called true-bypass circuitry which helps preserve your guitar tones. 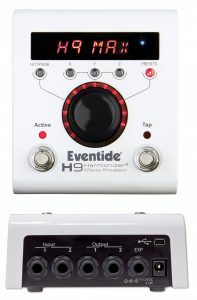 The Eventide H9 Max is definitely unique with a different personality other multi-effects guitar pedals, but may be the very thing you’re looking for. Let’s get back down to earth here and talk about one of the best multi-effects pedals without a bunch of technological advancements upping the price. The Dark Side is a famous one for sure and is praised for its overall sound and the quality of its effects — keeping it vintage, it’s based off a ’77 fuzz circuit. We have a multi-head delay effect with twelve syncopated delay patterns, with a nice modulation section that includes flanger, u-vibe, phaser, and rotary speaker effects. Many are designed after Pink Floyd, and if you listen closely you’ll see for yourself. No fancy recording interfaces here, MIDI or USB, but this will be preferred for those who just want a raw, high-end analog multi-effects pedal with only some of the pizzazz we’ve seen in our previous few picks. It focuses more on the raw sound and the tones are beautiful with this one. 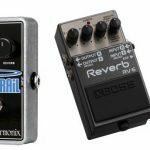 You can indeed connect an expression pedal if you’d like, and there’s a nifty order switch to tweak your effects chain if you’re in the mood. Just a raw pick as the best multi-effects pedal here, and we highly recommend the Keeley Dark Side if you don’t need anything but the essentials — great sounding effects with no bells and whistles. Zoom isn’t necessarily a familiar guitar brand per se, but this particular model is definitely one of the best multi-effects guitar pedals out there and the user reviews don’t lie. We’re only getting fan favorites of guitar effects with overdrive, distortion, reverb and flange to name a few, but also some more advanced and rare multi-effects such as Gold Drive, Reverse Delay, HD Hall, and more. You’re also getting a lot of (about 100, and more will continue to roll out) custom-designed effects combination patches that Zoom created with some popular legends, such as Van Halen, Hendrix, Page, Santana, if you’ve ever heard of them. There are also 10 on-board amp and cabinet emulators on top of the FX with this one. Classic amp models standout, such as the Fender Twin Reverb or Marshall JCM800. You can edit using a decently-sized display, and you can store up to 200 of your own custom chains to use later on (access with them with the footswitch on-the-fly if you need to). Ins and outs are covered, with a dedicated headphone jack, L/R for amps, PA systems and interface. 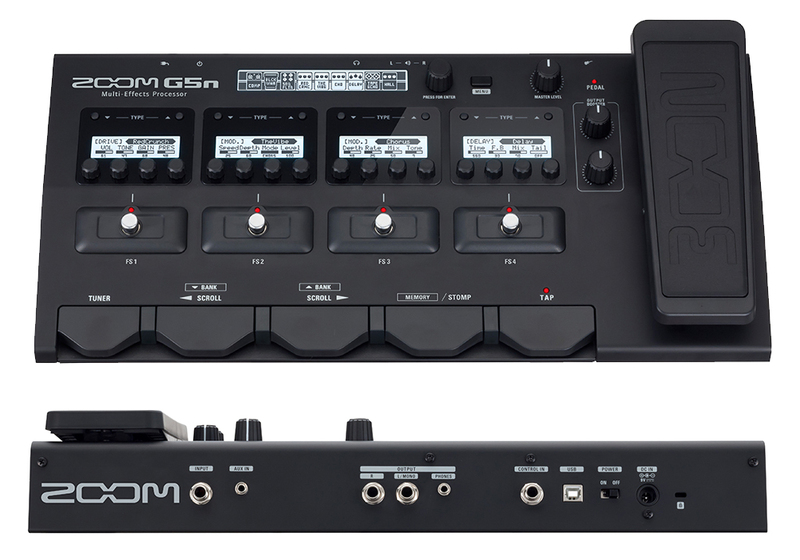 Ultimately, the Zoom G5N may be the best multi-effects processor for you since it doesn’t come with too little or too much — a beautiful pedal that balances both the necessities and few extras on top of it all. 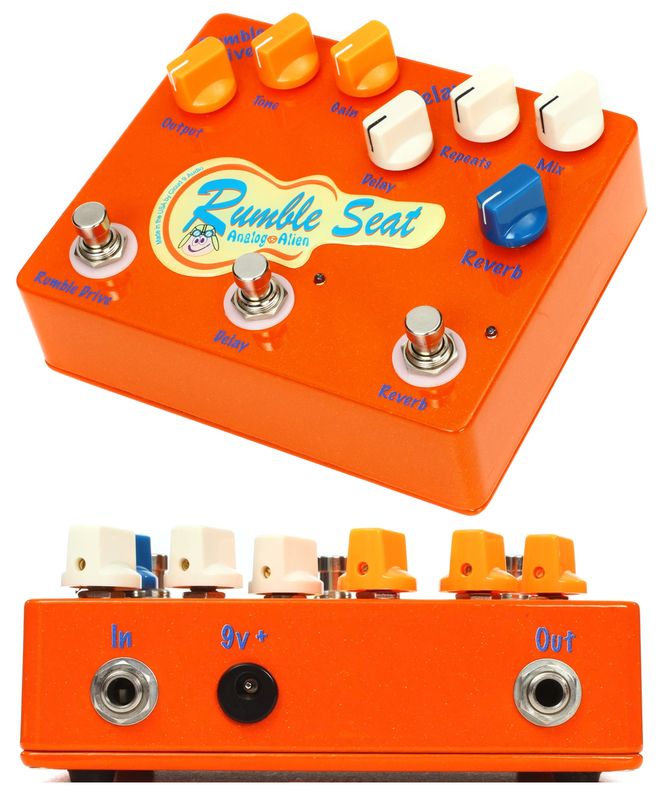 The Rumble Seat brings us three of our most desired guitar FX in a very compact and travel-friendly design. The overdrive section aids in your mood for a total overdrive or a slight tone boost, while the delay can give us a range between 25ms to 650ms and reverb for a beautiful after-effect of each note we strum. User reviews really praise this guitar multi-effects pedal for its overall tone control (you can make it sound pretty vintage — something we love or perhaps just go for a full face-melting approach). The Rumble Seat just sounds great and is built very sturdily. No fancy features here, such as MIDI, a crazy amount of ins and outs, or recording interfaces. Just pure guitar FX at your fingertips, all independently switchable. We recommend it for those who are concerned with only a few different FX instead of hundreds to being able to choose from. The lack of options doesn’t necessarily bring a con for some — many just need the essentials and would like to tweak them as they’d like, and also need a smaller, condensed multi-effects pedal to add into their pedalboard. The Analog Alien Rumble Seat focus on sound — and that’s all you may be looking for. Another Line 6 pedal here listed for good reason, and this particular pedal from the legendary brand takes us down a notch into the realm of a more simplistic multi-effects pedal with just a slight mixture of extra features and digital compatibility. 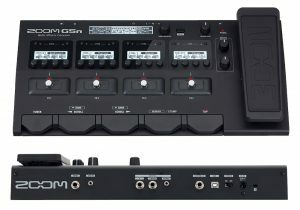 This will be great for those who want multiple effects as well as some computer recording capabilities but don’t want to spend nearly a grand on their model (like with the first few picks). Let’s see what we have at our fingertips with the POD HD500X — 100 studio and stomp effects, high-quality HD amps (with deep parameters like Sag, Bias, Hum, etc. ), dynamic DSP to stack effects, mix and match HD amps, cabs, mics and effects, 512 presets, flexible ins and outs with music software compatibility (using USB or MIDI), built-in chromatic tuner, as well as some extra XLR mic ins in case you need this be a hub of your rig. Also a decent 48-second looper. 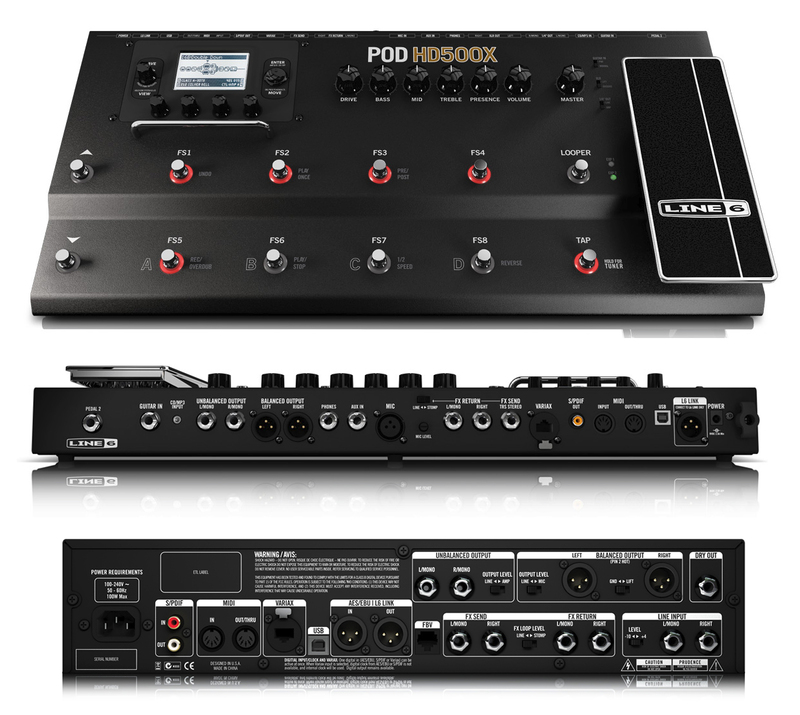 These are just a few of our favorite things, but with the Line 6 POD HD500X, you’re getting more than just a multi-effects pedal, but not too much to keep the price reasonable. Let’s get into another heavy-hitters in the category of the best multi-effects pedals, and this time more high-end digital processing and jam-packed features for a very capable solution for those who need it. This one includes a Quad-Core DSP system for not only very fast but extremely powerful guitar FX processing, with all of the features able to be tweaked on it’s clear 7-inch display (touchscreen, by the way). This one has some features we’ve never really seen before, but again are all on top of the multi-effects function to act as ‘extra’ if you’re in need of them. Some of the standouts include using the touchscreen to swipe, touch or drag-and-drop settings to create and edit rigs on-the-fly (there is also a hands free mode if you need to do so during a gig), gapless preset switching, a looper (20 minutes of record time), loop peel off, twelve footswitches, and the ability to record and re-amp using the USB connection (24-bit, 96 kHz audio interface on top of it all). 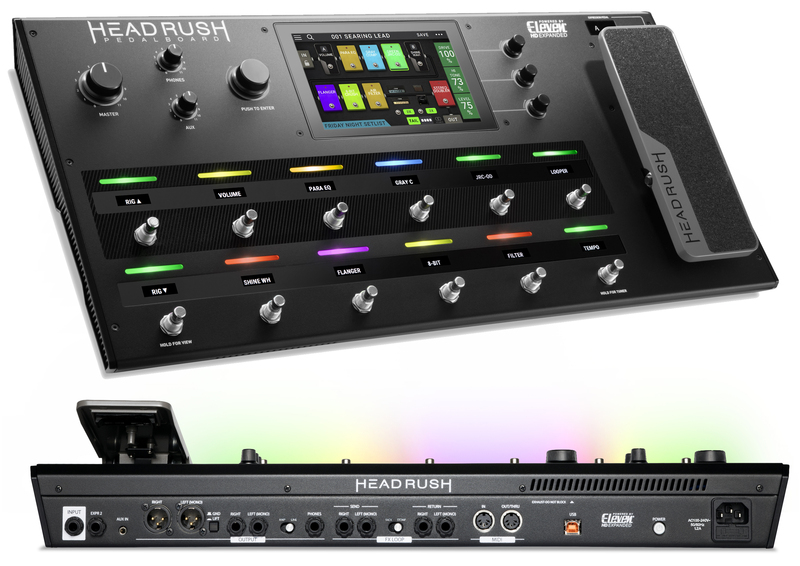 Yes, another beastly and extra-feature model to act as the best multi-effects guitar pedal here, but the HeadRush Pedalboard may be perfect for those who need a monster in their rig. Here’s another simple and affordable pick as the best multi-effects pedal available today. Boss has another appearance in here for good reason, and this particular pedal packs some power for a lower price-tag than their other recommend listed previously. 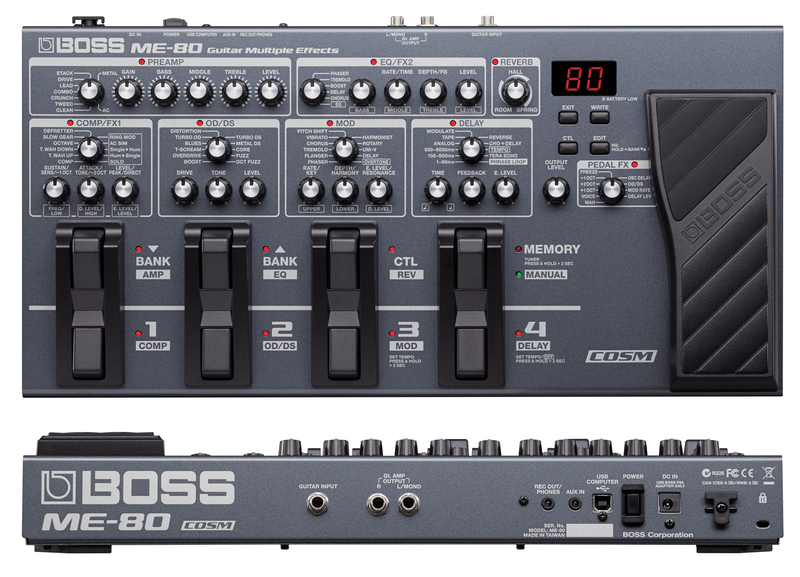 The ME-80 has a very large amount of powerful FX here, with 23 distortions, 11 and modulation to name a few. A built-in guitar preamp is also inside with their ‘COSM technology‘, and the MDP (‘Multi-Dimensional Processing) for tech we saw in their previous pedal which aids in processing (tone preservation and power). A few other highlights in this particular multi-effects pedal by Boss include dedicated knobs for each parameter, an expression pedal, 8 footswitches, phrase loop function (delay time of 38 seconds), and their included BOSS Tone Studio software in case you’d like to get going digitally (there is a USB connection). 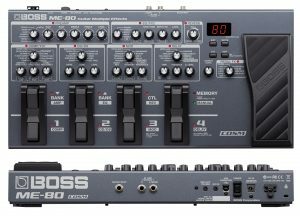 The Boss ME-80 hits the sweet spot for price-range while still providing us some extra guitarist necessities, such as a preamp, extra tweaking ability and advanced processing. It has about 59 effects altogether. 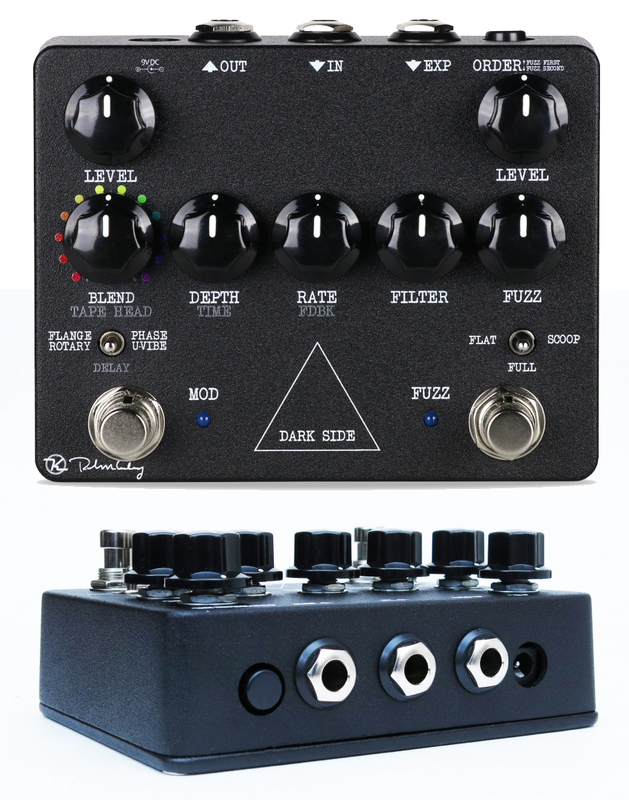 Lastly, let’s go with a different spin to a ‘multi-effects pedal’ — this time for vocalists. We know every single pedal in here is for guitarists, but there also may be some of you who also sing or may be simply looking for a multi-effects vocal pedal. The VoiceLive Play is essentially a floorboard pedal that even looks similar to a guitarist pedal but for singers. Acting as a mic preamp, it is footswitch controlled and gives us harmony, pitch correction, effects and more than 200 presets to play around with. You can select and browse through their presets by genre, and there’s also a ‘practice mode’ for helping you work on your accuracy as well. The smart harmonies and pitch correction can aid in making our vocals sound better if you need it, but most importantly are the numerous effects to add to our vocals to give us a unique sound. You have only 1 XLR mic in here, but also USB connectivity to work with your computer rig if you need to. The TC-Helicon VoiceLive Play may only be feasible for some, but we wanted to include it in this list of the best multi-effects pedals just in case.